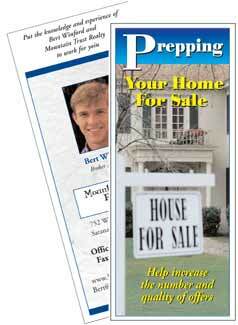 Advising customers and prospects on how to properly prepare a home for sale is good for them and good for you. A little attention to detail can bring in more offers faster, as well as higher selling prices. 8.5 x 11, full color tri-fold on 100lb gloss text. Customize It - Once you've placed your order, you'll upload or email your photo, logo, contact info and any designations you'd like to include. We'll send you a proof, normally within one business day. We don't print it until you say it's ready.